Read the label – Always read the manufacturer labels for all products being used and follow instructions exactly. Be sure to keep the chemicals in their original container so that the label is always available. Keep products dry – When pool chemicals come in contact with even a small amount of water, toxic gasses can be released. Always add the chemicals to the pool water, not water to chemicals. 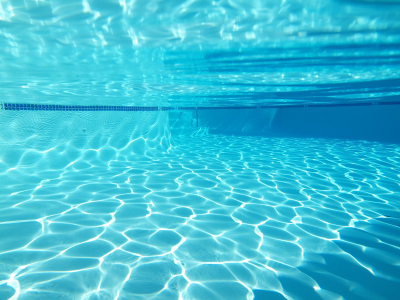 Proper storage – An important part of keeping pool chemicals dry is storing them correctly. Do not store chemicals on any surface that could possibly get wet. Regularly check the storage area for window, door, or roof leaks that could be a source of water. Keep containers of chemicals away from any drains or water sources such as faucets or pipes. It’s also important to close the containers completely. Don’t mix – Never mix a pool chemical with another substance as this can cause dangerous gasses to form (e.g. chlorine gas). Only handle one chemical at a time, and keep them away from other substances. Even mixing old and new bottles of the same chemicals has been reported to produce gases. Protect yourself – Be sure to use protective coverings for skin and eyes when handling pool chemicals. Keep away from children – Kids are prone to get in to everything, and pool chemicals are no exception. Be sure to store chemicals out of reach and sight of children; better yet, lock them up! Pool chemicals should only be handled by adults who have taken the time to educate themselves about proper use and storage. Even after educating yourself, accidents can happen (that’s why they are called accidents!) So what should you do? If pool chemicals get on the skin, immediately flush with lots of clear running water. If chemicals touch the eyes, they must be quickly flushed out with a gentle stream of tepid water for at least 15 minutes. Continue for at least 15 minutes even if the eye(s) seem to be getting better! After rinsing the skin or flushing the eyes, call the Illinois Poison Center (IPC) – 1-800-222-1222 – for advice about any other treatment that might be needed. Inhaling gasses from pool chemicals can cause symptoms such as irritation in the nose and throat and sometimes cough or shortness of breath. If any of these symptoms occur while you are dealing with chemicals, be sure to get to fresh air immediately. Then call the IPC to see if there are any other measures that need to be taken (call 911 immediately if having trouble breathing). Remember to be smart when using chemicals so that the summer fun can continue. The following websites contain even more information about Pool Safety! Copper Sulfate: Pool Cleaner, Vineyard Helper or Unsuspected Summer Threat?